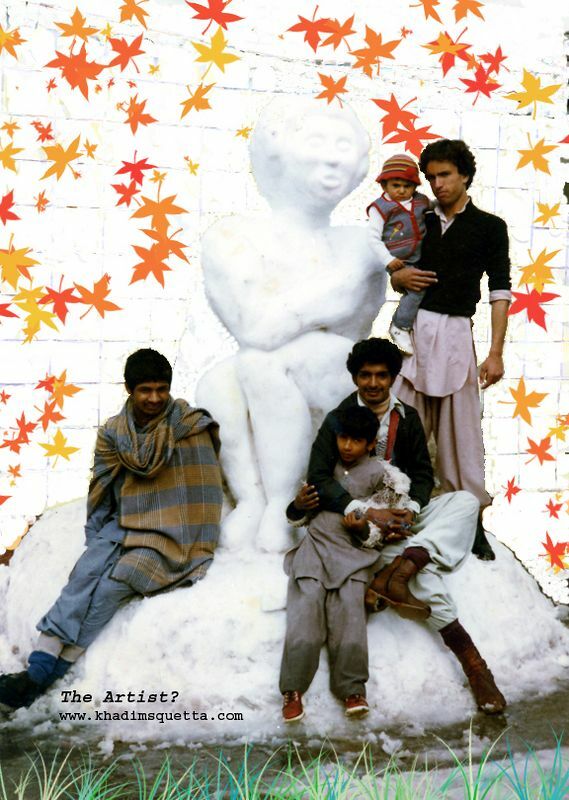 In winter Quetta does receive its reasonable share of snow - sometimes heavy and very often a thin blanket. The Quetta residents wait impatiently for snow fall season as that can mean lots of things to different people: to the farmers and fruit-growers a good amount of snow means lots of underground water for the coming season. To the city dwellers replenishment of their natural underground water aquifers. To lovers a romantic day or two and to artists or would be artists an opportunity to improve their soft carving skills. In fact it was in the winter of 1981/82 when it had snowed exceptionally heavily that I made my first ever attempt to make something out of snow (see picture 1). The outcome was quite encouraging but the skill melted away with the snow... nothing for the next 10 years ... and again I had to grab the opportunity in the winter of 1991/1992 when I was visiting a friend of ours in Khanozai (a small town tens of kms to the north-east of Quetta. 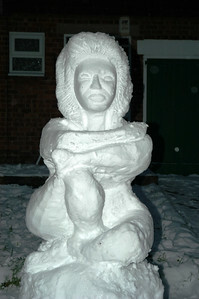 On that occasion the result was a conservative snow-woman that reflected the cultural sensitivities of the area. 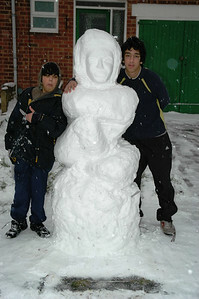 My third snow woman was the one that I made last winter (Feb. 2007) here in the UK (Birmingham). 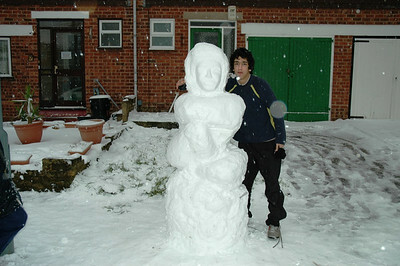 So in total I carved three women out of snow in 25 years!!! Had I switched to and worked on stone carving, I would have produced at least one piece of art each year, that is, 25 pieces in 25 years. But that would not have been possible as working on rocky stuff means you need a rocky determination, something that is terribly absent in me. I'm what I'm - a lazy man and content with my sluggish life style! At least my snow women can not melt me down! 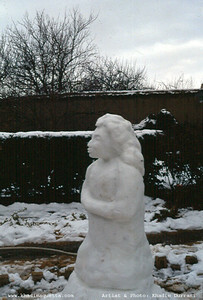 The Snow woman! In January 1982 it had snowed exceptionally a lot! I grabbed the opportunity and mobilized a few young lads. By means of an avalanche (a snow ball!) coalesced enough snow to work on it. I started carving a man but at the end it turned out to be a woman! Not everyone was pleased with it due to his or her religious convictions. It took me a couple of hours to complete my premier chef-d'oeuvre! Luckily a few people had photographed my snow woman - as it did not melt but was beheaded in the evening while I was away, at home, trying to compensate for the lost body heat due to the hard work of the day! In January 1982 it had snowed exceptionally a lot! I grabbed the opportunity and mobilized a few young lads. By means of an avalanche (a snow ball!) coalesced enough snow to work on it. I started carving a man but at the end it turned out to be a woman! Not everyone was pleased with it due to his or her religious convictions. It took me a couple of hours to complete my premier chef-d'oeuvre! 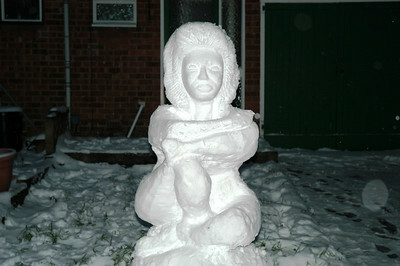 Luckily a few people had photographed my snow woman - as it did not melt but was beheaded in the evening while I was away, at home, trying to compensate for the lost body heat due to the hard work of the day!